Forum: Best Shahtoot Mulberry Is Red Or White? Best shahtoot mulberry is red or white? I need a mulberry primarily as a fast-growing deciduous shade tree (unless you can recommend an alternative). Black will stain the paving and is slower growing, so I'll have to get white or red (I'll grow a dwarf red in a pot). If you are concerned about staining, white shahtoot is the one to go. Apparently, it is sweeter than the other two. White is like a sugar hit, it is the sweetest variety. The red, personally has a raspberry cordial sort of taste. Having more than 1 type helps to appreciate them all the more. Whether you have mulberry stains is determined primarily by number of flying foxes in the area, not by your fruit alone. 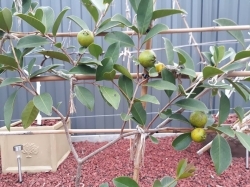 With the right conditions & depending on size planted will grow faster than most fruit trees. I have a 15cm wide stem mulberry, cut it back severely and it grew 1.5m in a season. Temperatures where you are would be comparable with Brisbane.